November is here but the weather pattern the next 5 days looks more like December. That means cold rain showers in the valleys and lots of mountain snow, plus some snow (above freeway level) is likely in the Columbia River Gorge too before the weekend is out. Today we actually have an “arctic front” sitting across the northern part of Washington State draped east and west from an area of low pressure over the Strait of Juan de Fuca. I’ve colored it in red on this sea level pressure map. You can see the cold air north of that line. Overnight the low pressure will weaken and drift south. But the cold burst of northeast wind won’t make it any closer to us then around Seattle west of the Cascades. That leaves us with scattered showers and a snow level down to around 2,000′ or so the next two nights in our area. Friday will feature a mix of showers, sunbreaks, and cooler temperatures. A 2nd disturbance drags more of that arctic air over the Pacific Ocean and spins up a low pressure center Saturday evening. 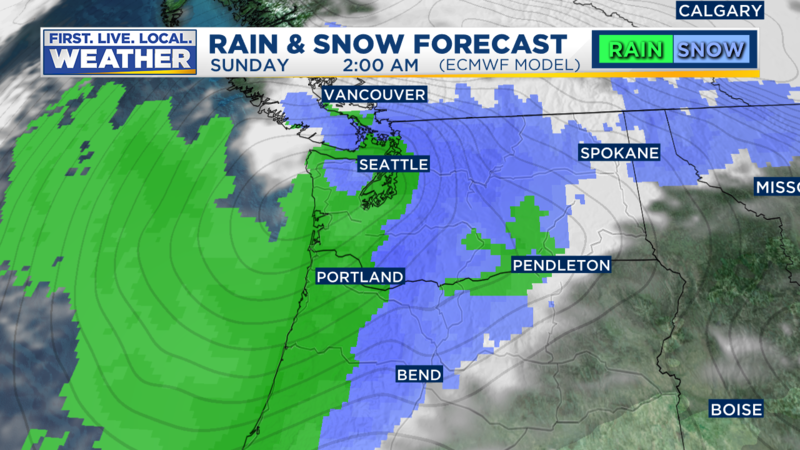 That low moves inland across SW Washington Saturday night and Sunday. This means another burst of snow in the Cascades and valley showers later Saturday through Sunday. 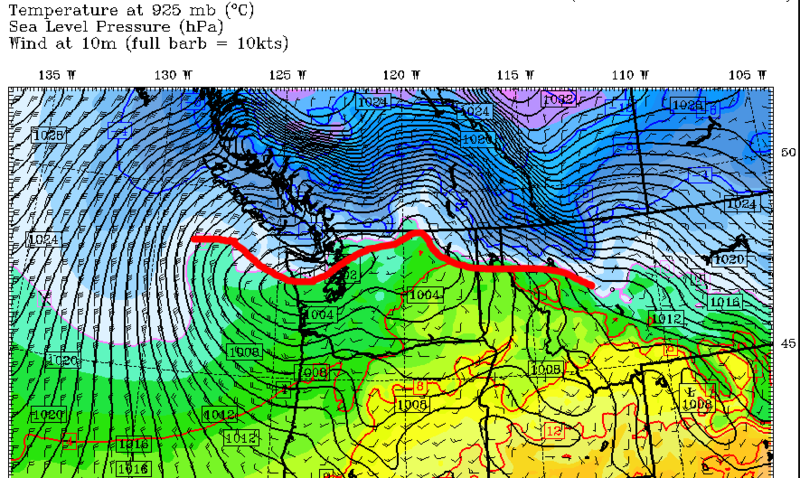 Luckily the low is passing by to the north which will minimize any cold air getting pulled westward through the Gorge. One of the inferior models (GFS) was showing just this setup in the past few days, but it has now come around to the “warmer” models. That said, in such a chilly airmass it’s always possible we’ll see snow at the eastern end of the Gorge. 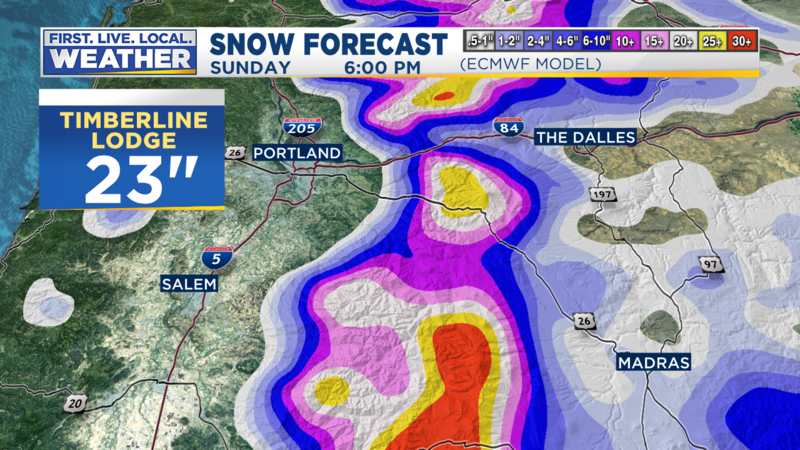 If you live in the upper Hood River Valley or anywhere else near/above 1,000′ at the east end of the Gorge there’s a pretty good chance you’ll wake up several inches of snow Sunday morning. If the low comes any farther south than forecast, snow could fall very close to river level too…if it does. Here in the metro area our wind should be southerly, pushing snow levels up to around 3,000′. To summarize: The next few days will be cool and showery in the lowlands, with highs only in the 40s Saturday and Sunday. Lots of snow will fall in the mountains, but snow won’t stick at any point below 2,000′. Once the Sunday system exits, we’ll be left in a cool and mainly dry beginning of the week (Monday & Tuesday). 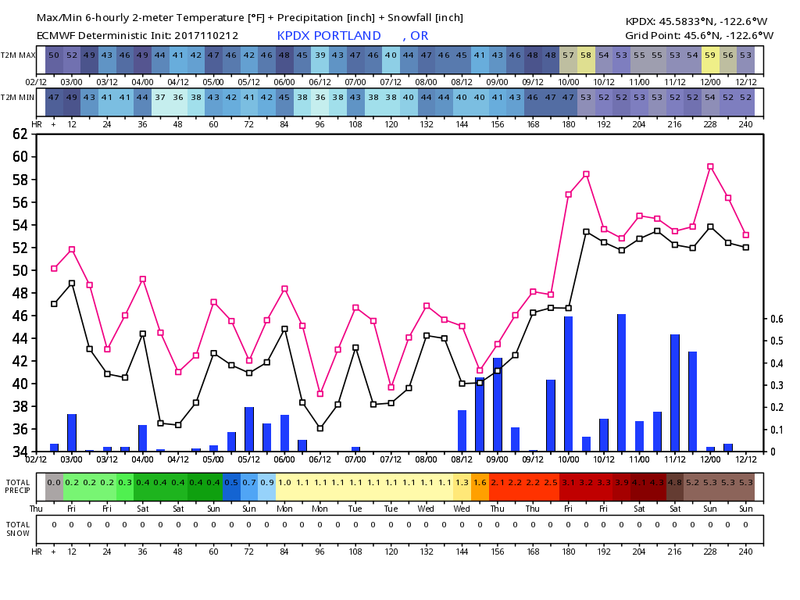 Models diverge quite a bit for the 2nd half of next week. 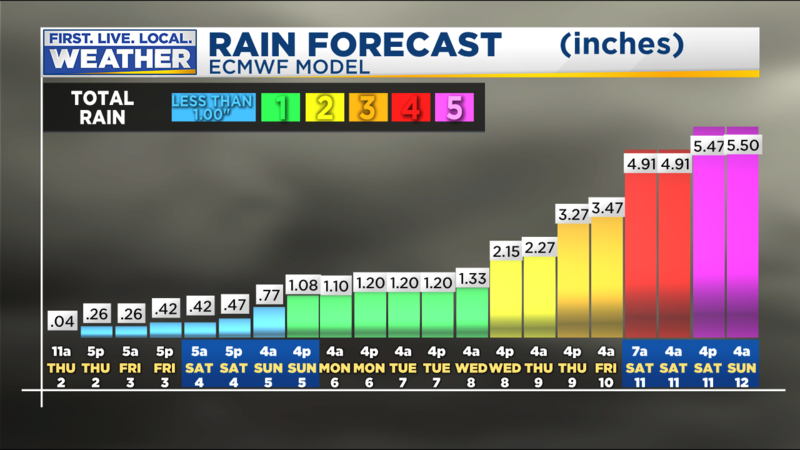 The more reliable ECMWF shows mild atmospheric river event the 2nd half of the week and into the following weekend. This would of course bring more rain than snow to ski areas. But other models keep us in a cooler pattern with several more surges of cool air coming in from the northwest the next two weeks. Regardless, you can enjoy this early taste of a winter chill! This entry was posted on Thursday, November 2nd, 2017 at 7:15 pm and is filed under Weather. You can follow any responses to this entry through the RSS 2.0 feed. Both comments and pings are currently closed. Just changed over from rain to snow shortly after daybreak. Lawn starting to get a whitish tinge. Not expecting to get a whole lot more, based on forecasts. Still, 5 Nov and now two lowland snow events for me. Not a bad start to winter at all! of a cold pool develops in the Gorge and East Metro on Tuesday night and Wednesday in order to determine whether there could a threat for some early season freezing rain on Wednesday. I cannot recall, did the snowstorm in December of 2008 give us blizzard warnings throughout PDX? I’m fairly sure it didn’t. Wondering if this is our Winter for such a storm in the NW. Far past due. Lots of stories in the Wild West history books on storms with paintings of them. I wonder what that would look like on live radar and on computer models beforehand. I was living in PDX in 2008 and I don’t think so. There were blizzard warnings (and blizzard conditions) but only in the gorge and parts of the metro area closest to it. I believe the blizzard warnings were for areas east of I-205. I was living west of downtown; it was breezy and there was some drifting but it was hardly a blizzard. We were in Troutdale in 2008. I can’t recall for sure in there were “official” NWS “blizzard warnings”; but I know for a fact that we experienced blizzard “conditions” by any/all definition of the term! Totally awesome! Steady but light snow has been falling here since about 11am. Temperature is at 34F, so it’s not sticking on ground or street surfaces yet. People who are seeing snow, where are you and what elevation are you at? Winter weather advisory issued for my area. Latest model runs have put the higher lowland amounts exclusively on the northern and eastern sides of the Olympic Peninsula. Looks Like Port Angeles and Sequim are going to get it again. Haven’t seen a WRF-GFS run with more than a trace for me in a while now; looks like the one that was saying 4-5″ for me was an outlier (as I sort of expected). Honestly, I can’t complain. Never expected to see any snow this early. It sort of snuck up on me before I even started model riding well into the future. Overcast and 39˚F at quarter to noon. Was in the twenties overnight. Could this be an event where location may be as important as elevation? Up this way, definitely YES. The Fraser outflow is supposed to kick up again overnight, and the northern and eastern sides of the Olympic Peninsula will be getting upslope winds as a result. If the models hold, lots of areas near sea level will be getting 4 or more inches, while areas away from the upslope event, even those at 1000 or 2000 feet elevation, will get little or nothing. Even at my house (100 feet elevation), I’m much more likely to get a dusting of snow on the ground from “Hood Canal effect spillover” than the summit of Squak Mountain at 2000 feet (way too far east to get any spillover) — and the recent model runs all show this clearly. Strange. Kids got home at 3:15, it was 48 degrees. An hour and a half later it’s now 38 degrees. I don’t think I’ve seen the temp drop that quickly before, unless it’s under a thunderstorm or something. Today’s high was 38 here. That makes it both my first sub-50˚F and my first sub-40˚F high of the season. Beautiful Weatherdan Weather in San Antonio today 85 and Sunny! Glad I’m not there! Too warm. I’m going to place it firmly in the wishcasting department at this stage, but the UW WRF-GFS model has me getting 4 to 5 inches Saturday night. If anyone would have told me two weeks ago that I’d be posting on the 3 Nov about the possibility of a 4+” snowstorm in a couple days after already receiving my first sticking snow of the season, I would have said they were nuts. A dusting of snow for me here this morning as well, though plenty of place east or south of us seem to have had more. (Bellingham reported 4 inches, I heard). More chance of snow tomorrow afternoon and evening, but it depends on the temperature and other variables, of course. Snow falling at sea level being reported all throughout the Puget Sound basin this morning, pretty much everywhere North of Olympia. I’ve seen reports of 3 inches in Bellingham, and snow falling in Kirkland, on the beach at Orcas Island, Bremerton, Woodinville (Hollywood Hill — Seattle), Boeing Field, and Shelton. Seems to be moving Southward as the morning progresses. Snowing in West Olympia, Tumwater, and just North of Centralia. Snow just started up again here about 5 minutes ago. Not accumulating. What fell overnight is all melted. My lawn is dusted with white! Expected perhaps some flakes in the air but not that. NWS now forecasting a possible repeat performance Saturday night and Sunday morning. Looks like possibly much more snow for you in the next event. Bring on the snowpack! Chains in my trunk: check. Ice scraper with brushes on the other end: check. Stocking cap close by: check. New car battery to replace the old before the cold kills it completely: check.